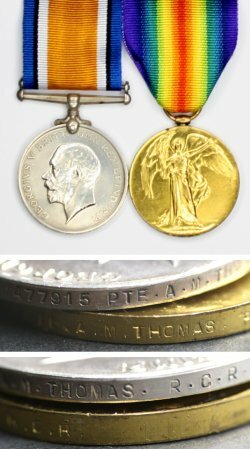 First World War medals awarded to 477915 Pte Albert Morley Thomas. Albert Morley Thomas (name also given as Alfred) was a Canadian Permanent Force soldier of The Royal Canadian Regiment who attested for overseas service with The RCR at Halifax, Nova Scotia on 24 August 1915. 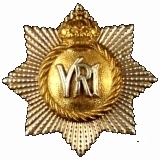 He has been serving in The RCR since enlisting in London, Ontario, on 4 April 1911, and had over 16 years prior service in the British Army (regiment not specified). Thomas served in France with The RCR and with the 3rd Division Train. He died of wounds on 28 March 1918. The CEF pair of medals issued in Thomas' name form part of only the CEF entitlement of a larger group. Given an arrival date in France of 2 November 1915, he is also entitled to the 1914-15 Star (confirmed in service record). 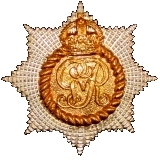 Without knowing more details of Thomas' British Army service, we can surmise that he may also be entitled to the QSA and/or KSA for British Army service, the India General Service Medal 1908 (with bars?). No Memorial Cross was issued following his death. A plaque and scroll were dispatched to his next of kin. Albert Morley Thomas was born 16 Jun 1869 at Bristol, Somerset, England. On the nominal roll for The Royal Canadian Regiment in Bermuda (1914-15), Albert Thomas identified his next of kin as his father, J. Thomas. His father's address was given simply as "Bristol, England." Later, in his CEF file, he changed his next of kin to his brother, Mr. James Thomas, whose address was "Downvers, Ashley Down, Bristol, England" and, afterwards, "Address later given as 82 Walcot St, Bath, England." Albert Morley Thomas was a Soldier of the British Army and of the Canadian permanent force before the First World War. Unfortunately, details of his British Army service are lacking from his Canadian records. His CEF attestation paper notes that he had 16 years 148 days service in the British Army. His entry in the Commonwealth War Graves Commission database states"served as Colour Sergeant in Indian Frontier Wars, also in the South African Campaign." 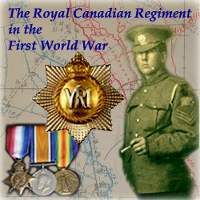 Thomas enrolled in The Royal Canadian Regiment on 4 April 1911, joining "K" Company at London, Ontario. he was given the Permanent Force regimental number 7678. Thomas declared himself to be 40 years of age, and reported his trade as "Soldier." Thomas later transferred to the Halifax garrison on 16 September 1912. Thomas is listed on the nominal roll for The RCR in Bermuda. The Regiment served in Bermuda from 14 September 1914 until 26 August 1915, replacing the Lincoln Regiment for service in France. The Regiment was replaced in turn by the 38th Canadian Infantry Battalion and then return to Halifax to reattest for overseas service with the Canadian Expeditionary Force. Albert Morley Thomas attested for overseas service with the Royal Canadian Regiment at Halifax, Nova Scotia on 24 August 1915. At the time of his attestation for overseas service in 1915, Thomas was described as: age 46 years; height 5 ft 4 1/2 in; weight 157 lbs; girth 37 3/4 in, 3 in range of expansion; physical development good; complexion fair; eyes brown; and hair dark brown. While training in England preparing for front libe duty with the Regiment, Thomas fell afoul of the military justice system. On 22 September 1915 he was charged with drunkenness and found guilty. The punishment awarded consisted of 168 hours detention and a fine of $6.00 (i.e., six days pay). Thomas disembarked at Boulogne on 1 Nov 1915 with The RCR. He served with the Regiment until being attached as a Brakeman to the 3rd Division Train on 7 February 1916. 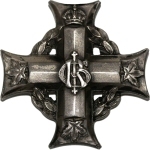 Thomas spent a year with the Corps Troops and on 25 March 1917 he was struck off the strength of the 3rd Canadian Division Employment Company and transferred back to The Royal Canadian Regiment. Private Thomas enjoyed a break from the Regiment's rotation between the front lines, supports and billets when he was authorized 10 days leave in July 1917. Between the 17th of July, when it was authorized, and the 29th of July, when he returned, he spent 10 days on leave in Paris. "AVION SECTOR - 26 March 1918 - Wire received about 1.30 a.m. from 3rd Division to be ready to move at 1 hours notice, after 5.30 a.m. this morning. This was cancelled about 6.30. Working parties during the day and night, practically the same as that which obtained during the last tour in supports. Very quiet day. 20 O.Rs. from C.C.R.C." "AVION SECTOR - 27 March 1918 - Practice "Stand To" 4.30 a.m. Besides working parties Headquarters Details wired in front of ANXIOUS Trench on left ARRAS-LENS Road and took over from one company of the 116th Bn. in GERTIE Trench from VIMY- AVION Railway to T.14.C.60.30. Relief completed at 1.30 a.m. Capt H.F.R. GRIFFITH attd to 3rd Div. Sigs. 10 O.Rs. to C.C.S." "AVION SECTOR - 28 March 1918 - During the night hostile gun shells bombarded THELUS. At 2.00 a.m. gas projectors were fired by our troops in HILL 70. There was a little artillery retaliation. At 7.45 a.m. wire received from 7th C.I.B. to "Stand To" as a very heavy barrage had opened up on our right, apparently on the whole line from MERICOURT to ARRAS. Shelling continued heavily all day, both in Forward and Rear area. German aeroplane brought down on our front by rifle and L.G. fire of P.P.C.L.I. Wounded Officer and unwounded N.C.O. captured. "Stand Down" came in at 9.30 p.m. Night quiet. 1 O.R. wounded. 2 O.Rs. from Mil. Prison." 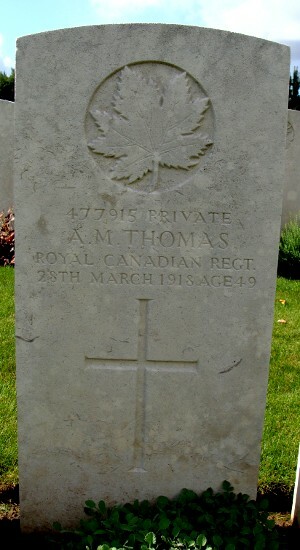 477915 Private Albert Morley Thomas, The Royal Canadian Regiment, died on March 28, 1918, at age 49. He is commemorated on Page 511 of the First World War Book of Remembrance. Aubigny-en-Artois is a village approximately 15 kilometres north-west of Arras on the road to St. Pol (N39). From the N39 turn onto the D75 towards the village of Aubigny-en-Artois. The Cemetery lies south on a road leading from the centre of the village, and the Extension is behind it. "From March 1916 to the Armistice, Aubigny was held by Commonwealth troops and burials were made in the extension until September 1918. The 42nd Casualty Clearing Station buried in it during the whole period, the 30th in 1916 and 1917, the 24th and 1st Canadian in 1917 (during the capture of Vimy Ridge by the Canadian Corps) and the 57th in 1918. The extension now contains 2,771 Commonwealth burials of the First World War and seven from the Second World War. There are also 227 French burials made prior to March 1916, and 64 German war graves. The extension was designed by Sir Reginald Blomfield. No. of Identified Casualties: 3067"
477915 Albert Morley Thomas is listed in The C.E.F. Roll of Honour (Edward H. Wigney, 1996) on page 743. His age is given incorrectly in the reference as "29".